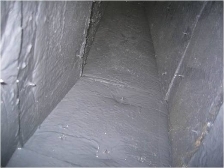 How do you know if your office or building need air duct cleaning this summer? In this series of three monthly posts, we’re telling you about the top three signs of problems that your building engineers or air conditioning technicians should look for when they’re performing typical maintenance like changing the air filters. Our first post covered the problems that excess dust can cause and last month’s post looked at visible mold growth in ductwork. Missed the emails or need a refresher? No problem! Check it out here on the blog. In our final installment of our series, we’re looking at the number one reason why people call us for air duct cleaning: odors coming from the vents. Just like we looked at in last month’s email, mold in the ductwork can cause a number of problems, first and foremost a musty or mildewy smell. Every time the air conditioning unit turns on, the air rushes across the surface of the mold and sends it airborne into the occupied space. In the “after” photo of that ductwork, we’ve vacuumed out the dust and fungal growth, then sprayed the insulated ductwork with a sealant that discourages future fungal growth. 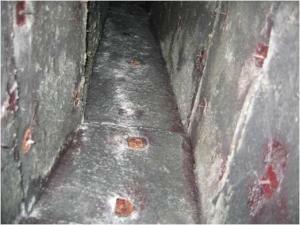 Even with routine cleaning, large cooling coils that are serving a commercial space become dirty over time. If you or your tenants notice a musty smell, it could be that your cooling coils are clogged up with debris. When that debris gets moist, it can quickly develop mold and mildew. That fungal and bacterial growth can spread down the ductwork, pushed by the force of the air blowing through the a/c, and make a small problem (fungal growth on your coils) a big problem (fungal growth spread throughout the whole HVAC unit). 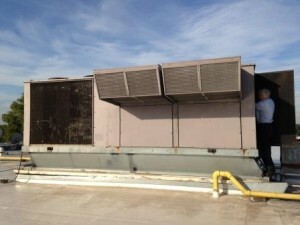 To prevent that bigger problem, give us a call to clean your cooling coils. A little preventative maintenance now can save you a lot of headache in the future. But why call Power Vac America for your coil cleaning? Sometimes the source of the smell is in the air handler itself. 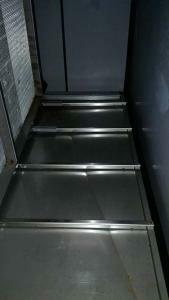 Even with regular maintenance, dirt and debris can build up in the pan of the air handler unit, which then becomes a source of food for mold and bacteria. When the mold problem starts in the air handler unit, all of the air being pushed out the vents downwind is going to have odor issues. 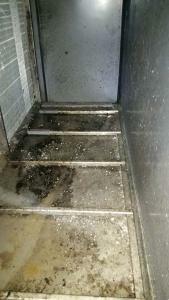 In this following Before/After photo, you can see that the dirt and debris in the air handler unit pan has become damp from the moisture coming off the cooling coils. This has created a perfect home for mold and bacterial growth. When your building engineer or technician is changing out the air filter on your a/c unit, that’s a great time to take a look into the ductwork to see if you have an mold problem beginning. You can also watch out for this yourself by watching out for any mold growing on the air vents around your building.